Marketingcommunicatie: Samenvatting colleges, aantekeningen en hoofdstukken A full summary of the examination material for the final examination marketing at Radboud University. This summary contains the lectures, my notes and the chapters of Marketing Communications: A European Perspective "by Pelsmacker et al (5th edition)..
Summary of book chapters - Marketing Communication A summary of the most relevant chapters studied for the course Marketing Communication year 2016/2017. 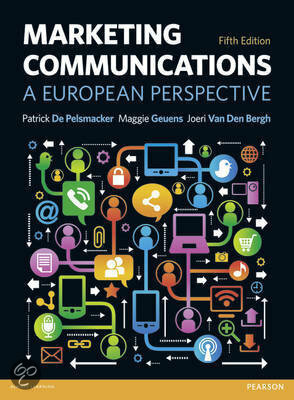 This summary includes the chapters 1 - 12 from the book "Marketing Communications: A European Perspective" (De Pelsmacker et al., 2013) 5th edition. IC exam block 2.2 Media and Communication Summary: Media and Communication theory block 2.2. Marketing Communications Summary of Chapter 5, 6, 8 & 9 Comprehensive summary of Marketing Communications chapters 5, 6, 8 & 9. On this page you find summaries, notes, study guides and many more for the study book Marketing Communications, written by Patrick De Pelsmacker & Maggie Geuens. The summaries are written by students themselves, which gives you the best possible insight into what is important to study about this book. Subjects like Marketing, Master, Communication, Marketing Communication, Marketing communications, IC, Pelsmacker & Marketing Communications will be dealt with.